The first night we were in Charleston, we went to the Rooftop at the Vendue to watch the Cavs game. Definitely a cool place to check out if you’re in the area. I didn’t take any pictures because I didn’t have my camera with me, but you can look it up! Gorgeous views of the city! That night, we grabbed an icecream at Jeni’s on King Street. We had the Darkest Chocolate in a waffle cone. So yummy. The first full day in Charleston we went to Sullivan’s Island. I was so impressed with the little town. There were tons of restaurants and shops, but it wasn’t a huge touristy area. When we made it to the beach, I was shocked to see not a single hotel or condo. Unfortunately, no white sandy beaches and crystal clear water, either. The Atlantic was dark and the sand was almost black and muddy at parts. The wind was almost unbearable the first day and the sand blew in your face. We only stayed for a little while, but the last day we were in Charleston, we came back and it was much better. We stayed out there for a couple of hours and go super sun-burnt. We even got in the ocean for a little while! Shocker! We ate lunch at Poe’s Tavern, which was a recommendation from a friend, after author Edgar Allan Poe who was stationed on Sullivan’s Island between the wars. Only nineteen at the time, he left his mark on Sullivan’s Island and the island apparently had quite an effect on him, as well, providing the setting for at least three of his stories. After Poe’s, we explored Patriot’s Point where we went aboard the USS Yorktown. Such a fascinating experience, I’ll just let the pictures speak for themselves. For dinner we ate at Monza on King Street where we had the most amazing pizza I’ve ever had in my life. We spilt the Caesar salad and the Materassi pizza which had fresh tomato sauce, mozzarella and basil. We added some chicken in there, too. You’ll notice we split everything because we are tiny people. For desert we grabbed a Death by Chocolate cupcake from Cupcake Downsouth. Nom. We ended the night by wondering through Marion Square and the College of Charleston, which were absolutely beautiful. I am back from one of the best trips of my life. Charleston, you were so good to me. Perfect weather the entire time and the most delicious food I’ve ever tasted. I’m already counting down until my next visit. Over the course of the next few days, I will be posting about my trip: places we ate, visited, and discovered. I’ll show you the meals we ordered, desserts we devoured, and the gorgeous buildings we saw along we way. The Holy City is just as beautiful as I imagined. The steeple skyline towers proudly over the historic buildings and residences as you enter the city. There’s a least a dozen churches, each one full of character and awe. My favorite, St. Michael’s, is located at the corner of Broad and Meeting streets, on one of the four corners of law. The oldest religious structure in Charleston was a beacon of hope during the revolutionary period. The church tower was a target for British ship gunners. In the hopes of decreasing it’s visibility the white tower was painted black, which sadly made it even more visible against the blue sky. St. Michael’s is just one of the many awe-inspiring churches around Charleston. St. Matthew’s is another beauty. Beaming Gothic windows and red-painted doors, St. Michael’s possess the tallest spire of any of the buildings in South Carolina (hence why I couldn’t fit it all in one picture!). Resting on King Street and across from Marion Square, St. Matthew’s was fatally destroyed by a fire in 1965. The majority of structure was rebuilt, but the stain-glass windows under the apse and under the balcony as well as the pulpit inside are original to the building. Other popular churches we did not get a chance to drive by are St. Philip’s and St. John’s, both equally gorgeous. Next time we visit, I’ll make sure to snap a photo of those. I will be unplugging for the majority of the trip, so make sure you catch me on Instagram for daily shots. See you guys in a week! For once, I actually own two of these items: the shorts and the nail polish. One, those shorts are super comfy and were only five dollas! I can’t wait to wear them everyday in Charleston. Okay, not every day. Second, this polish has gotten tons of reviews from strangers! They grab my hand and stare. It’s a perfect shade for a lot of different outfits. Maybe not these shorts, though. Pick it up at any drugstore. As far as everything else on this board, that Sole Society clutch is to die for and that ring from Ariella would match it perfectly. (Everything in this collection is coveting.) Black sandals are a must, might as well get a pair with a bow! Those pineapple ice cube trays would be the highlight of any party and that classic white tray is always great to have on hand. I’ve been blogging/journaling for over four years. 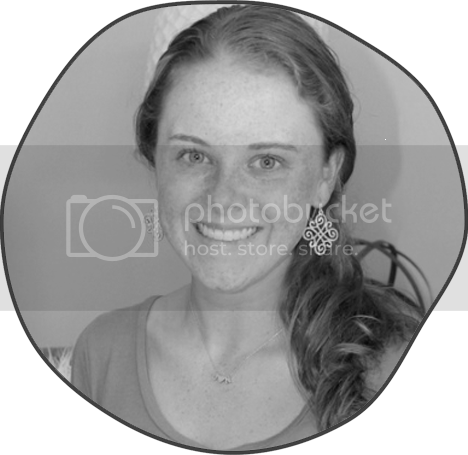 My first blog (lord, bless me) was terrible. I had no clue about branding or graphic design to save my little life. However, I grew and I think that Thirty-Seventh Avenue is the treasure that I was digging for. I’m proud of my little corner of the World Wide Web. I’ve worked hard on making it truly me and not someone else. As I continue to grow and learn, I find ways of making my life a little easier. Thirty-Seventh Avenue is a lifestyle blog, for lack of better words. The majority of the topics I discuss are food, fashion and interiors with the occasional eco-friendly/organic, literature, DIY, and posts like the one you’re about to read. 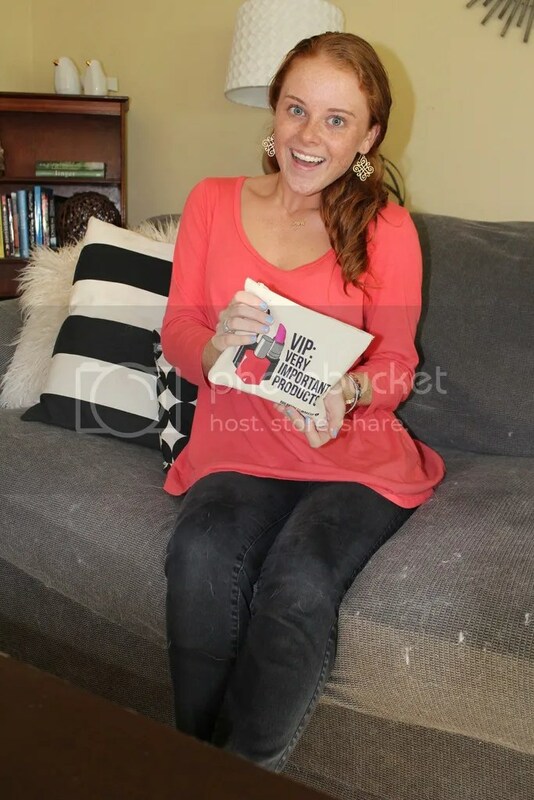 My hope is that if you’re reading my blog for the first time and you are thinking about starting your own, that this will help. 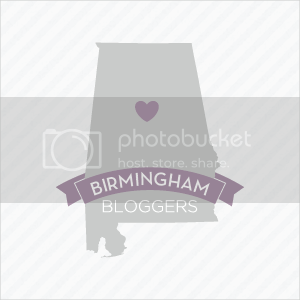 I’m not an expert, but I do have a piece of advice if you are planning on starting a blog or just need help with the one you’ve got. FIRST AND FOREMOST, GET A CALENDAR. I could not even begin to express the importance of this. Whether it’s a print-off from Google or a pretty one from May Designs (or the freebie at the end of this post), you need something that you can schedule your posts in/on. The one thing I’ve learned from blogging is that being organized and scheduled will save your sanity. There’s nothing worse than waking up and not having anything to post. No bueno. Before you can schedule your posts, you have to come up with a few categories on what you want to discuss. If you look at the ribbon on the top of my page, I have a categories button. Hover over that, and you’ll see that I have three main categories and two additional categories. If you want to get really into it categorizing, within each category you can have sub-categories. Hover over any of my five and you’ll see more that jut out to the right. Bottom line: pick at least three and stick with that. Now that you have a calendar and a few categories, get to scheduling. I see a lot of bloggers designate certain days to certain topics such as Wish List Wednesday and Thursday Word Day. I try to do that myself, too. It just takes out the guess work. Typically, I find that topics flow to me easier when I’m scheduling what I already know I want to post. If I’m writing about my new patio herb garden, I begin to think of four or five recipes I could create using my new herbs. Next thing I know, I have two or three weeks planned! This is where this handy dandy calendar I made comes in handy. If you’re new to scheduling, get this FREE printable to help you out. You’ll be amazed at how simpler your life will be knowing that a week’s posts are complete. The only thing left is to type them up and save them until it’s time to publish them. So, whether you’re thinking about starting a blog, new to the blogging world, or just want to be a better blogger try scheduling your posts and see what happens. It may not work for you as much as it does for me, but it’s worth a shot! *This is not a sponsored post! I pay for this subscription on my own. However, this post does provide referral links for new sign ups which gives me points to go towards purchasing full-size products. 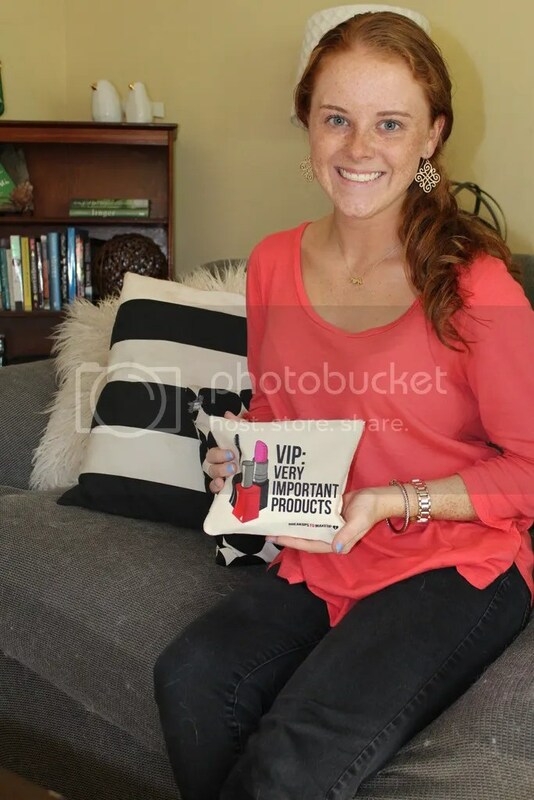 I am so excited about sharing with you my first Ipsy glam bag. If you haven’t heard about it, it’s a monthly subscription of mini beauty essentials designed around your personal skin type and preferences. It’s kind of a miracle, really, for those of us who have panic attacks when they walk into Sephora and have no clue what to buy. Okay, maybe just me. I’m not a beauty expert, so I hope to learn how to pick the best products that will work for me through Ipsy. 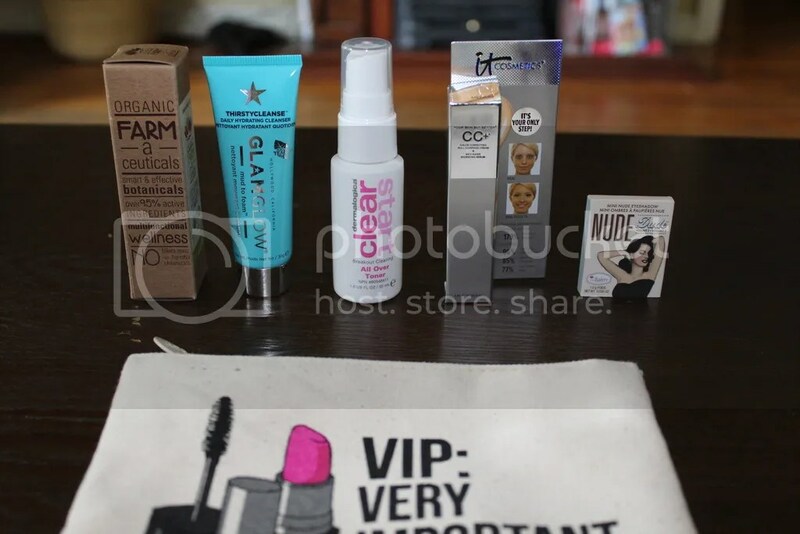 Each month I will review what I received in my glam bag. Granted, this is before I actually have time to try out each one, so you can watch for updates on my social media outlets as I discover if I love it or hate it. 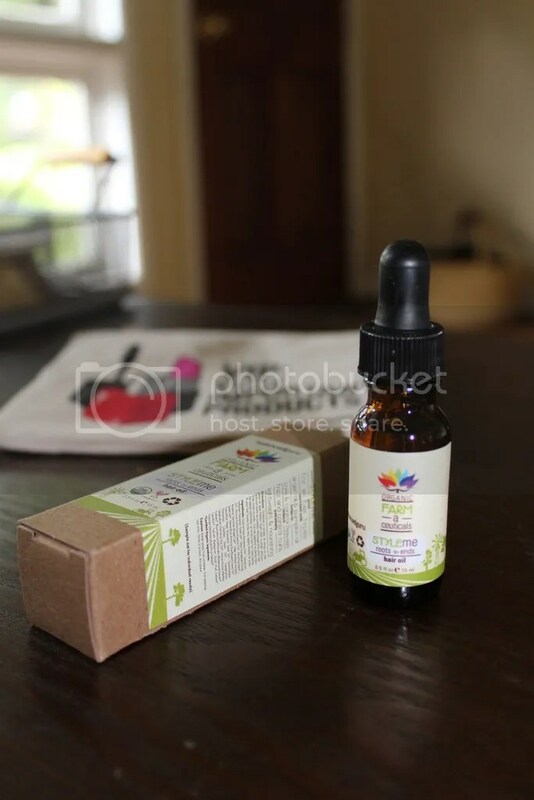 What is it: Style Me Balanced Guru Roots To Ends Hair Oil, $18.99\5 oz. What’s it for: All organic, cruelty-free formula designed to style and control frizz, curls and flyaways. 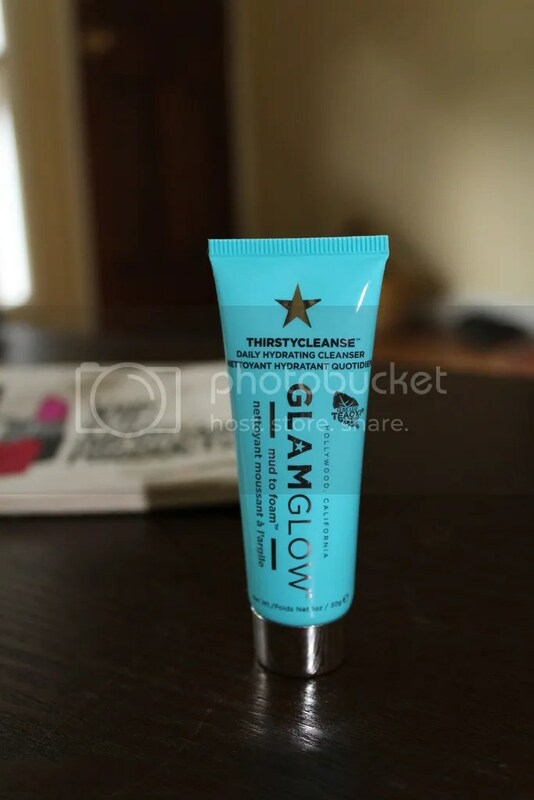 What is it: GlamGlow THIRSTYCLEANSE Daily Hydrating Cleanser, $39.00\5 oz. What’s it for: Mud to foam daily cleanser that combines the power of mud and the performance of foam for a daily cleansing experience. What is it: Dermalogica Clear Start Breakout Clearing All Over Toner, $19.50\4 oz. What’s it for: A mist-all-over purifying toner that controls excess oils and helps eliminate breakouts on the face and body. 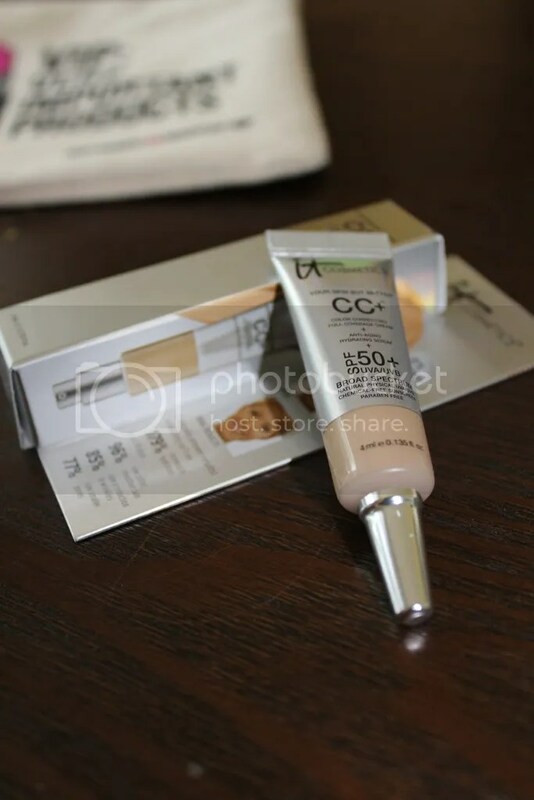 What is it: It Cosmetics Your Skin But Better CC Cream with SPF 50+, $38.00/1.08 oz. What’s it for: All-in-one multi-tasking beauty miracle that truly gives full, flawless, perfect coverage, protects your skin with SPF 50+ from the harmful rays of the sun and is clinically proven to improve skin texture and hydration. What’s it for: Get a quick look using any combination of these triple-milled shadows or dress up your look by adding water to transform your favorite shades into loyal liners. 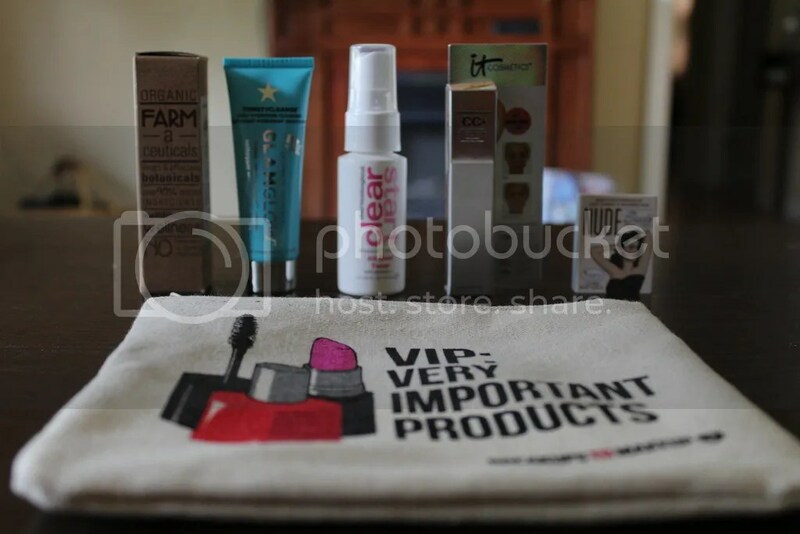 Overall impression: This is my first glam bag and I am very pleased with the products that I got. I’m really looking forward to trying out all of them. 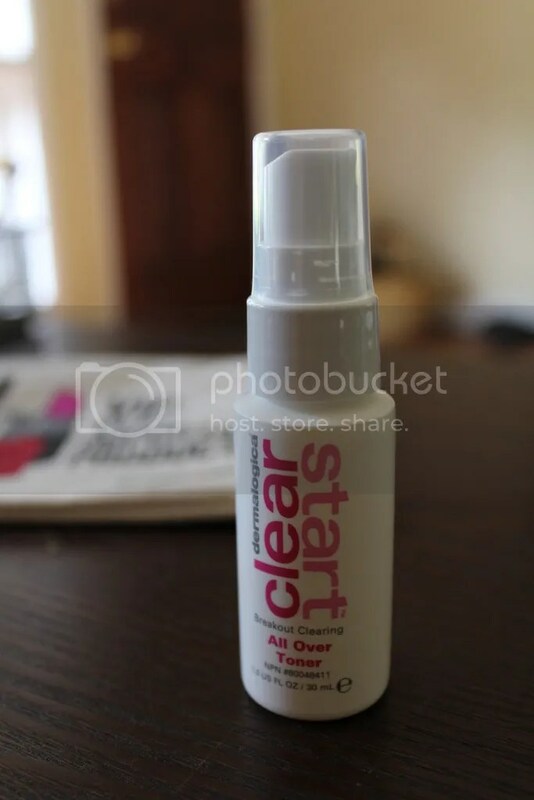 Favorite item: Clear Start All Over Toner – I’m looking forward to having this when I go to the beach for a quick spritz to keep my skin looking fresh all day! If you’re interested in joining Ipsy, follow this link to sign up. For only $10 a month, you get five miniature samples of some of the best beauty products on the market. As you can see above, these items aren’t cheap! You get all of that plus a cute little bag to store it all in. What more could you need?